Since 1981, we have been bullish on Tourmaline due to the hardness, color range, size, rarity and low price. Over the past few years, larger and/or finer colors of Tourmaline have started selling for $1000+/ct on both the retail and wholesale markets. Higher priced material prior to this time frame was Paraiba Tourmaline (1989) and more recently, the deposits of the wonderfully colored Mozambique Tourmaline (2006 +/-) which has essentially disappeared from the market as the mine/locality has not been producing as it once had. 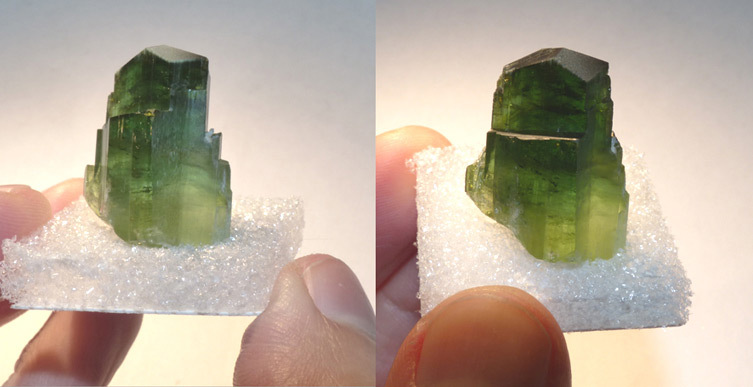 (A small parcel of very fine Mozambique Tourmaline rough was offered to All That Glitters from the mine owner in 2013 at a value of $1,100,000.) 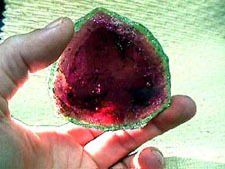 Maine Tourmaline is frequently $1000/ct for fine color and larger pieces. This gem of a watermelon slice is destined to be housed in "...a fabulous collection of Maine minerals and gems This exceptional museum quality collection will be permanently preserved and on public display within 2-4 years." The purchasing agent for this museum collection, had the following to say: had showed me the slice before he set up the display... I got a great look at it in my hands, prior to being displayed and saw how beautiful it is. That s what cinched it for me."